The New International Version is the most highly supported translation for study with over 50 Bible commentaries, references, and other Bible study resources available that are based on or keyed to the NIV text. Whether scholar or beginning Bible reader, you’ll find a wealth of resources to support your deeper study of Scripture. 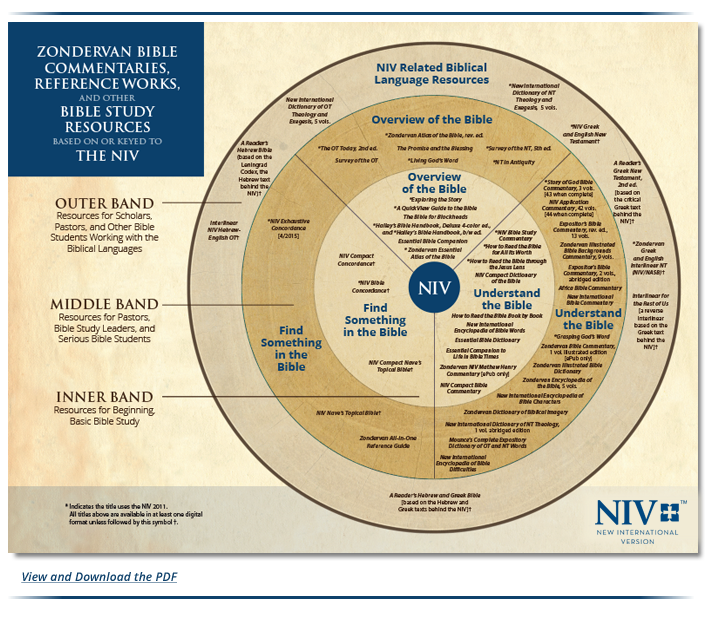 Those with an understanding of the original Hebrew and Ancient Greek languages of the Bible will appreciate the many NIV related biblical language resources. Pastors, Bible study leaders, and others who engage in deeper study highly value the extensive line of NIV resources. The NIV text is the most supported translation available with a wealth of commentaries, references, and resource books that provide deeper insight, context, and meaning as you study God’s Word. NIV resources are also available for those newer to Bible reading. These include resources to help you better understand the Bible as a whole, as well as where Scripture addresses topics and issues of interest.